I am helping a friend with a schematic for his Viking powered airplane. See the attached pdf. Is it safe to eliminate the Schottky diode in the lower left corner? I want to remove the diode because it is one more failure point and I do not know if it can handle the full load of the main bus, perhaps as much as 25 or 30 amps. The concern is a short in the alternator or starter circuit (Or is this a remote possibility?) with no way to isolate it without stopping the electrically dependent engine. stopping the electrically dependent engine. current demands for the two ignition systems? My friend is building an RV-12 with an automotive engine, the Viking, which is fuel injected and electrically dependent. The power requirements for the ECU are not known but Viking uses 15 amp fuses. I do not like the electrical drawing on the Viking website because there are several possible points of failure all in series and supplying power to the engine through only one wire. I suggested to my friend that he use one of your drawings but he said they were too complicated. I tried to simplify by removing the E-Bus and E-Bus diode, while still having a redundant power source for the ignition and fuel pumps without having always hot wires pass through the firewall. The ignition and fuel pumps are located on the opposite side (aft) of the firewall from the engine. If the Alternate Feed Switch is turned on, the engine start circuit is disabled. This will prevent starting current from flowing through the Alternate Feed Relay and damaging its contacts. It is intended that the Alternate Feed Switch be turned on after starting and left on for the remainder of the flight. My friend prefers circuit breakers even though I recommended fuses. He also wants to keep weight down by not having a starter contactor. The Main Bus receives power at each end of the bus. If one connection should fail, the other will still provide power to the bus. The engine should keep running with power coming from only the Alternate Feed Relay or only from Master Contactor or only from the Alternator. The Viking ECU has two independent (almost) units in one enclosure, although it only has one wire supplying power. There is no pin-out available for the ECU 37-Pin D-Sub. The only information comes from the Viking website. The ECU has a SELECT wire that enables one of the two units, depending on whether the voltage on that wire is high or low. At least that is what I deduced from the scant information on the Viking website. The major difference between your excellent drawings and my schematic is that I have eliminated the E-Bus diode and replaced it with part of the Alternate Feed switch to prevent starting current from flowing though the Alternate Feed Relay contacts. Now, without that E-Bus diode, I am having second thoughts about possible reverse current due to faults in the starter or alternator circuit. power requirements for the ECU are not known but Viking uses 15 amp fuses. from Viking and the drawing you attached. and techniques for aircraft wiring. to arrive at the elegant solution. me in the crafting of their system. entire electrical system is even more "experimental". or demonstrably unsuited techniques and materials. Thanks for your words of wisdom so eloquently stated. I think that the Viking powered aircraft can be wired, for the most part, using one of your drawings. There is one item unique to the Viking that is not addressed: ECU SELECT. The Viking website recommends using one DPDT switch wired in parallel to act as a SPDT switch. 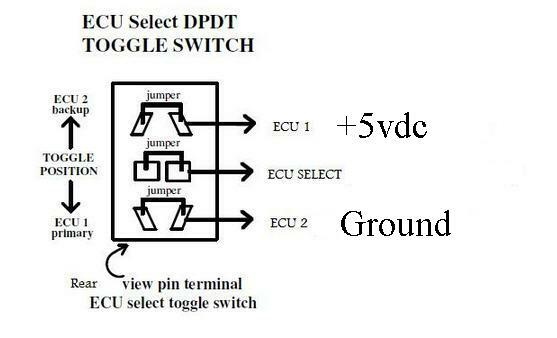 This switch will select either a high or low voltage and send it to the dual ECUs to enable either ECU1 or ECU2. My concern is that if this switch fails, the pilot will not be able to switch to the backup ECU if needed. Or if the switch fails open, who knows which ECU will be enabled, if any. It is unknown what bad things might happen if both ECUs are enabled at the same time, even for a second. Is it safe to use one switch to choose between ECUs? If not, is there a better way than to use 2 mechanically interlocked switches? Perhaps a solid state circuit powered by the aircraft supply so that it would not load down the ECU. part, using one of your drawings. there are precious few) and then pitch the document. recommendations. Separate switch for each ECU. the same time, even for a second. is insufficient to simply be able to fly the airplane. low risk flight system even for the "trust-me-it-will-work"
how ever much money it takes to drive the accident rate to zero. promoting as "trust me, this will work." Is it safe to use one switch to choose between ECUs? upon pilot knowledge and skill as system reliability. supply so that it would not load down the ECU. other machine that poses risks to people and property. of an ECU select switches. of the ECU power inputs need. Unfortunately there is only ONE power input to the Dual ECU. I find it hard to believe that the ECU manufacturer would provide only one power input to their dual ECUs. I suspect that the Viking Engine developer, Jan Eggenfellner , has elected NOT to use a second available power input. I do not know this to be a fact. It is just speculation on my part. question or others like it. Unfortunately, Mr Eggenfellner has not answered such questions, probably because he does not know the answers. He is a good mechanic but might lack electrical knowledge. systems demand in cruising flight. This question has been asked on the Viking website with no response from Mr Eggenfellner. If my assumption is correct that a high signal enables ECU1 and a low signal enables ECU2, then it would be impossible to operate both at once. No one knows the consequences of the simultaneous application of both high and low signals to the SELECT wire or the consequences of an open floating input. My friend is making the final decisions on wiring his airplane. He has accepted some of my recommendations and rejected some. From my point of view, it is hard to design a fool proof system without knowing the requirements or answers to above questions. All I can do is ensure that power is always available to the lone ECU power wire, regardless of the failure of any one component. And ensure that there is either a high or low signal on the SELECT wire, but never both at once. I think that we agree that the electrical system for the Viking engine has not been designed with a backup plan in the event of failure of key components. I am happy with my Rotax 912 engine. but never both at once. I think you're right . . .
steer clear of . . .
the SELECT wire, but never both at once. offering critical systems to aircraft. it might have been the Eggenfellner product. would take a similar approach. Normal and Alternate engine control switches. one taking power from an Aux Battery Bus. and command for Survivable Failure Ops. to provide failure tolerant functionality. Joe introduced me to the Matronics forum, sponsored by Bob Nuckolls. There is an RV 12 section, and Joe submitted our concerns for public comments. Suggest you read the exchange and join the list. And so, my friend and others are aware of the inadequate electrical system illustrated on the Viking website. is working with at Viking and I'll make the call. I am not aware of anyone at Viking giving electrical advice beside Jan E.
I think that it would benefit Jan Eggenfellner to make available all information about the electrical system, especially the ECU. Helping to prevent crashes of Viking powered aircraft will help his business. Even if Jan E is electrically challenged, others can use information that he provides to come up with an electrical system that will keep the engine running despite the failure of any one component. Bob, I appreciate your concern. There may be some builders blindly following the Viking electrical drawings. But the builders that I am in contact with know the dangers and risks. Unfortunately the risks can not be mitigated without more knowledge of the ECU requirements and capabilities.